Maybe it is the heat of August or an Alligator Alert, but Florida is back to Kerry again. Bush's lead down there lasted one day. But perhaps it will be back to Bush tomorrow. Let's see, if Bush is ahead in polls reported on odd days and Kerry is ahead in polls reported on even days and the election is Nov. 2 but the results aren't known until the Supreme Court decides sometime in December, then ... who knows? If you are a Floridian and enjoy watching political ads on TV, you're going to be in hog heaven this fall. It is going to be a real squeaker and both sides are going to be pulling out all stops. Stay tuned. The other polls don't change much. 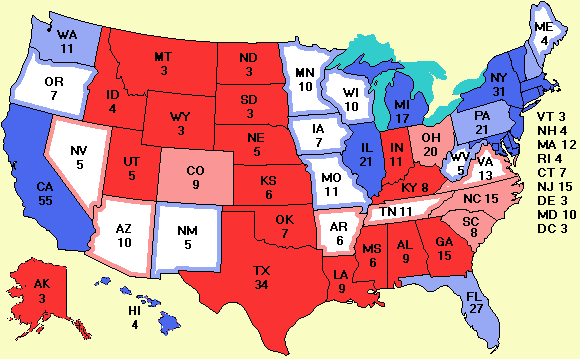 Kerry still has substantial leads in California and Pennsylvania and a small one in New Hampshire. A Rasmussen tracking poll puts him ahead in Oregon as well, but Zogby's poll is newer and says the same thing. How accurate are the polls, anyway? The National Council on Public Polling Review Board did a study on the 2002 election polls. The average error was 2.4% and 84% of the time the final result was within the stated margin of error. In theory, the final result should be within the margin of error 95% of the time, but it is doubtful that all the polls were taken on the eve of the election. Since some people change their minds after the final poll, 84% is not so bad. In fact, in Florida last time, some people even changed their minds AFTER the election. Julius Civitatus has made a plot of Bush's approval ratings since he took office. History tells us that when an incumbent is running for reelection, his job approval rating is the best predictor of whether he will be hired again or fired. An incumbent with a job approval rating above 50% usually gets his contract renewed, but when it falls appreciably below 50%, that spells danger. Civitatus has superimposed the dates of all the terror alerts on the plot. Worth a peek. One final point. I have said this before, but there are so many new visitors of late (about 40,000 visitors a day now) that is is worth saying again. I update the site in the wee hours of the morning and try to get it posted by 7 a.m. EDT so people can see it at work. You can claim you don't view political sites at work but you can't fool me because I know from the server logs that traffic drops sharply on weekends. As a consequence of this timing, when a poll is released in the middle of the day, I won't have it until the next morning. Morning newspapers have the same timing cycle. Many people have been reporting updates during the day, but the mail is getting unmanageable, so please DON'T report a new poll unless I miss it the next morning. Also read the FAQ to see which polls count and which don't. Thanks.